This may be the single hardest thing I ever have to write. Stan Lee, beloved co-creator of the Marvel Era of Superheroes, King of Cameos and Hype Man for all Comics, has died at age 95. Stan started in the industry at the dawn of the medium at the ripe young age of 17. There he was the gopher of then Timely Comics assisting Joe Simon and Jack 'The King' Kirby. By '41 he was the Interim Editor, then in '42, like many of his countrymen, he joined the Army as a member of the signal corps during the second world war. In the war he was one very few people to be given the job of 'playwright', working in the job alongside Theodore Geisel, better known as Dr. Seuss. Upon returning he took over the reigns of comic publisher until he was ready to quit in the early '60s, when his wife Joan Lee told him to write a comic that he would want to read and to give a shot--if it failed, he would quit and become an author, if it succeeded then he would stay in comics. That book was Fantastic Four #1, and history was made. Heroes didn't have to be larger than life, they could be the family (of rocket scientists) down the street. Teenagers and mutants leaped to the forefront of readers minds, with characters like Spider-Man and The X-Men. In the '70s Stan took a step back and he started touring the country, going to universities and talking about the industry and about comics in general. After several grueling years he left New York and headed up Marvel's early attempt to break into Hollywood, which was successful in animation, but floundered in live action. Away from Marvel he wasn't as successful and had very few major victories. His Stan Lee Media was invested for stock manipulation, Stan was NEVER implicated in the crimes, and the company went under shortly afterwards. He did see minor success with POW! Entertainment which is still going on to this day. Many young and old fans will remember him for his narration and cameos in the Marvel projects over the years appearing in every Marvel movie (besides the Blade Trilogy) since the late '90s. Stan was--I never wanted to have to refer to him in the past tense--one of the greatest champions a company could ever dream of, over the years he's become a household name. 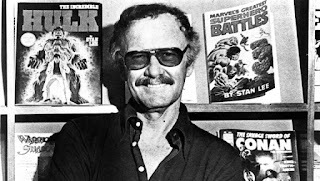 Stan to many of us, IS Marvel Comics, and his death will leave an empty spot in our hearts that we won't be able to fill. Rest in Peace Stan, you are loved, admired and pass from us a legend, Joan is waiting for you, it's time for you to finally retire. From all of us at the Movie Sleuth, thank you, we love you and you will be missed.